SOUTHWICK — As part of the Baker-Polito Administration’s efforts to increase public access for fishers and boaters across the Commonwealth, Department of Fish and Game (DFG) Commissioner Ron Amidon today joined state and local officials, recreational anglers, boaters and other project supporters today celebrated the reconstruction of the Congamond Lakes South Ramp in Southwick. The Baker-Polito Administration provided $319,000 in capital funds for reconstruction of the boat ramp and new boarding floats at the facility. The Department of Fish and Game (DFG) Office of Fishing and Boating Access contracted with BTT Marine Construction Company, LLC of Boston for the construction at the facility. The site has 18 parking spaces for vehicles with trailers, and complements another boat access facility one mile to the north off Grove Road that has parking for approximately 40 vehicles. Both facilities are managed by the Town of Southwick Lake Management Committee through a Land Management Agreement with the DFG’s Office of Fishing and Boating Access. The Congamond Lakes are well known for excellent fishing opportunities, particularly for largemouth bass, yellow perch, black crappie, and trout stocked by DFG’s Division of Fisheries and Wildlife. More than 80 bass fishing tournaments are permitted by the Office of Fishing and Boating Access at the North Ramp each year. Additional access at the South Ramp is particularly critical during tournaments and weekends and holidays during the summer. The Department of Fish and Game’s Office of Fishing and Boating Access provides boating and fishing access opportunities along Massachusetts’ 1,200 mile seashore and access to hundreds of lakes, ponds, rivers, and streams in the Commonwealth. 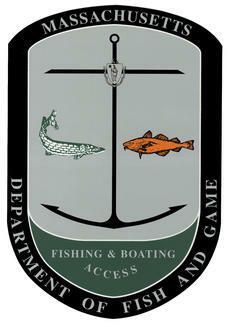 The agency oversees approximately 300 boat and canoe launch sites, shore fishing areas and recreational fishing piers. See this link for a list of all sites and more information. The Department of Fish and Game is responsible for promoting the conservation and enjoyment of the Commonwealth's natural resources. DFG carries out this mission through land protection and wildlife habitat management, management of inland and marine fish and wildlife species, and ecological restoration of fresh water, salt water, and terrestrial habitats. DFG promotes enjoyment of the Massachusetts environment through outdoor skills workshops, fishing festivals and other educational programs, and by enhancing access to the Commonwealth's rivers, lakes, and coastal waters.